Pet dentistry can improve your pet’s quality of life and can help keep your pet’s teeth and gums healthy. At Fairway Knolls Veterinary Hospital in Bloomington, we provide annual dental treatments to our pet patients. Dental disease occurs when bacteria builds up in the mouth. 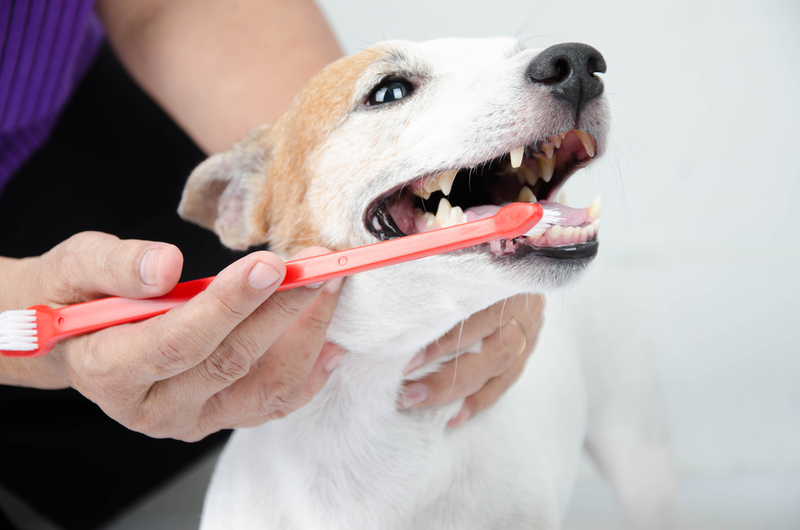 Inspecting your pet’s teeth on a regular basis can help you identify when your pet has dental disease, so you’ll know when your pet needs to see the veterinarian for a dental cleaning. At Fairway Knolls Veterinary Hospital in Bloomington, we provide annual dental examinations to our pet patients. During these dental examinations, we check for signs of dental disease and make recommendations for treatment. We put pets under anesthesia during these procedures to make the examination as productive as possible. Anesthesia also helps ensure that your pet is comfortable while his or her teeth are being examined. Dental cleanings. During dental cleanings, we remove plaque above and below the gum line, then we polish the enamel. Getting dental cleanings can prevent periodontal disease. Tooth extractions. When a pet’s tooth cannot be saved, we’ll perform an extraction to stop the spread of infection in the mouth. Cavity fillings. We provide cavity fillings to pets with cavities. Our cavity fillings help stop tooth decay. Pet owner consultations. We answer pet owner questions about how to brush their pet’s teeth at home. There are many reasons to get your pet dental care in Bloomington! Better breath. Pets who get their mouth cleaned regularly will have better breath, which makes cuddling your pet more enjoyable. Stop the spread of infection. Infections in the teeth and gums can spread to other parts of the body, causing health problems for pets. Stopping infections in the mouth can prevent infection in other parts of the body. Avoid lost teeth. Pets who suffer from long-term periodontal disease may lose their teeth with time. Treating periodontal disease in its early stages can help your pet keep his or her teeth into old age. Prevent tooth pain. Pets who suffer from periodontal disease may experience tooth pain, which can decrease your pet's quality of life. Taking your pet to the pet dentist can help your pet avoid tooth pain. At Fairway Knolls Veterinary Hospital in Bloomington IL, we provide pets in our community with a variety of pet dental services. We recommend bringing your pet to the veterinarian for a dental appointment at least once annually when your pet reaches adulthood. To make an appointment for your pet to have a dental examination, teeth cleaning or another dental care procedure, contact us at 309-663-1414.